Today when I asked to Thaara what she wanted for breakfast, she said PANCAKES. We had picked a box of strawberries while we went for grocery shopping and there were some left waiting to be used and also its her favorite fruit. So made Strawberry pancakes. It was soft and fluffy,with strawberries in each bite- they were too good. 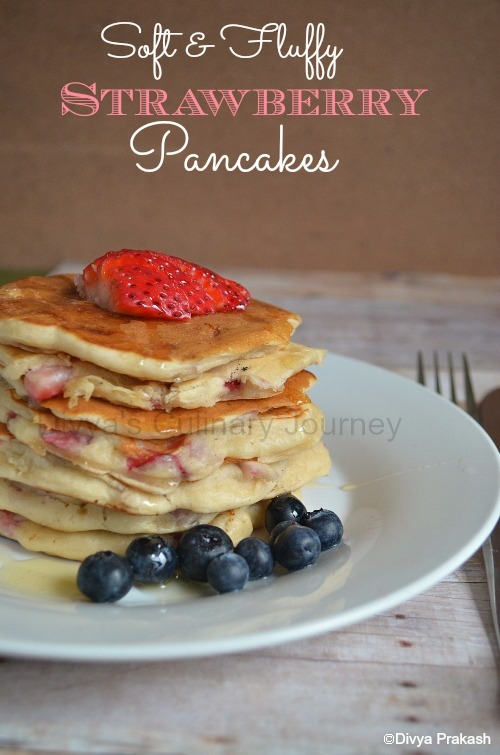 The pancakes are not very sweet but you can enjoy drizzling some honey or maple syrup for sweetness. 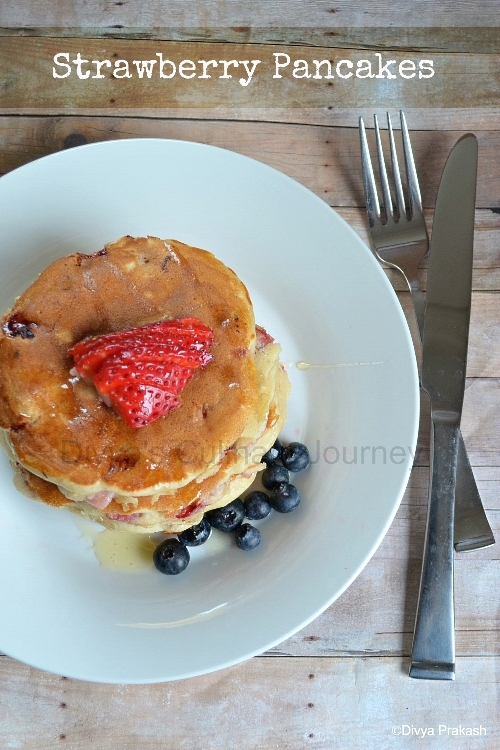 How to make Strawberry Pancakes? In a bowl combine flour, baking soda, salt and add egg, milk, honey, butter & vanilla extract and mix till they are well blended.Then fold in the strawberries. Heat griddle. Apply butter and pour a laddle full of batter on the griddle and lightly spread it. When the bubbles start appearing on the surface of the pancakes, turn them to the other side and cook for few more minutes till its lightly golden brown. Serve warm drizzling honey or maple syrup. You can replace honey with sugar too. colorful pancakes dear.. liked all ur clicks..
ohhh, its drooling over here..
Super fluffy and very tempting pancakes, i dont mind inviting myself to ur place for a breakfast. Kids delight .. loved the last picture..
Wow..soft n fluffy pancakes, sounds delicious too...loved all ur pics da :) good one!! 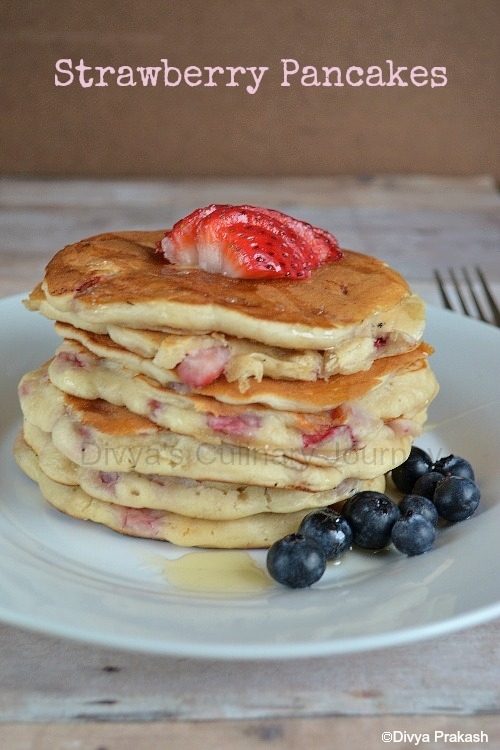 Nice and fluffy pancakes,looks yummy..awesome clicks.. I want some nowww .. they look so light n fluffy! soft & fluffy pancakes dear,looks yumm!! Oh yum, your pancakes look delicious! Wow! 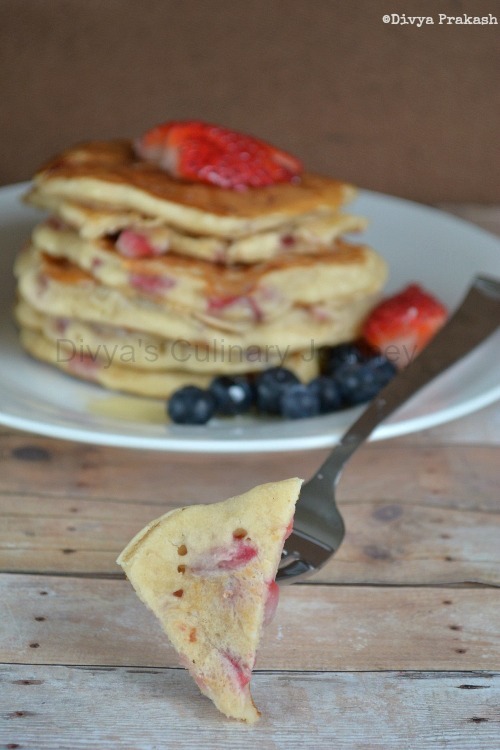 Divya ,very interesting recipe..
divya perfect... looks so delicious awesome clicks...first time here you have a great space..happy following you...when free drop into my space..
My son's fav.healthy with addition of fruits.